In the human body white fat predominates over brown fat by volume. White fat stores energy as triglycerides and is abundant in the midsection and thighs. Brown fat expends energy in the form of heat and is located in the neck and collarbone area. Brown fat implanted into animals improves their ability to utilize insulin. Brown fat positive subjects don’t gain weight with advancing age. For many years it was mistakenly believed the adult human body had no measurable amount of brown fat. PET scans began to reveal brown fat about a decade ago. The drawback of PET scans is that they only reveal activated brown fat. Obese individuals exhibit a slightly reduced body temperature during the day compared to lean individuals which results weight gain. More than 60% of the variance in body mass and body fat is determined by brown fat. Cold temperature, insulin, iron, thyroid hormone and adrenal stress hormones (norepinephrine) activate brown fat. Iron deficiency and beta blockers reduce brown fat volume. The healthy Mediterranean and traditional Japanese diets include foods, spices and teas that activate brown fat. A previously overlooked type of fat in the body that generates heat and is associated with leanness is now being avidly investigated. When brown fat is implanted in animals, their metabolism (insulin sensitivity and glucose tolerance) is improved. [Journal Clinical Investigation Jan 2013] So brown fat’s health benefits extend beyond weight control. The renewed scientific interest in heat-generating brown fat is due to the relatively recent recognition that humans have an abundant amount of this fat. For many years it as mistakenly believed that brown fat was only present in babies still in the womb and disappeared after birth. It is now known that the majority of humans have brown fat. As technologically advanced as PET scans are, they underestimate the prevalence of brown fat because they only measure activated brown fat. [Current Opinion Clinical Nutrition Metabolic Care Jan 2011] And of course, PET scans expose subjects to a radiation hazard. So they should not be utilized to routinely screen for activated brown fat, which is a transient condition anyway. Subjects whose brown fat doesn’t readily take up sugar as visualized on a PET scan tend to have modestly higher blood sugar levels. While the traditional description of the origin of obesity is rooted in an imbalance between energy intake (food consumption) and expenditure (such as exercise), only now have researchers discovered a metabolic difference between the lean and obese. Just a few pounds of weight difference in a year between those who have activated brown fat in their body and others who do not may sound almost trivial to a person who is 50, 75, even 100 pounds overweight. However, in one study it was determined that brown fat activity explains 64% of the variance in body mass and 60% of the variance in body fat from individual to individual. This is very compelling. Cold temperature, iron and lack of iron deficiency, insulin that facilitates iron availability, thyroid hormone and norepinephrine, an adrenal stress hormone, are involved in the conversion of white fat to brown fat as well as the activation of brown fat to produce heat. PET scan showing activated brown fat (left) in cold environment versus warm environment. 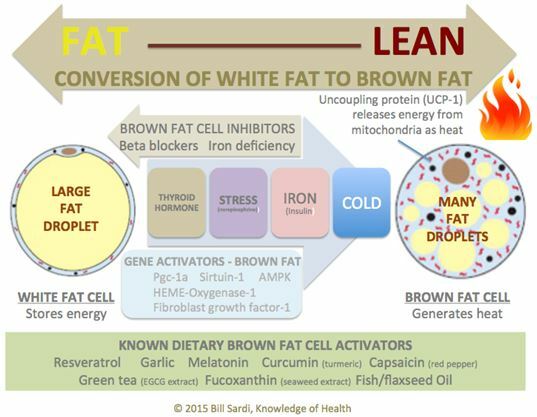 A number of dietary factors affect the conversion of white fat to brown fat as well as the activation of brown fat to produce heat. 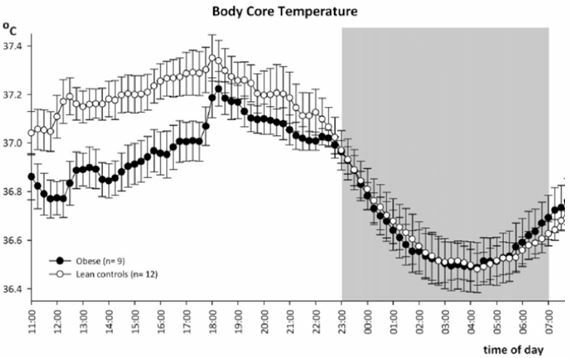 Experiments show that oxidation of fats is required for cold-induced heat generation (thermogenesis) in brown fat. [Cell Reports Jan 13, 2015] Therefore, iron-induced oxidation of fats suggests iron and easily oxidized fats such as from fish and flaxseed oil are companions in the activation of brown fat. What blocks activation of brown fat? Activation of brown fat is a therapeutic approach to obesity. Ironically, physicians widely prescribe a class of drugs that interfere with brown fat activation. Beta blockers block the uptake of sugar into brown fat. [European Journal Nuclear Medicine Molecular Imaging July 2007] Millions of Americans take beta blockers every day to help control blood pressure, heart rate and glaucoma. They unwittingly have no idea this drug produces significant metabolic disturbance that can lead to obesity, insulin resistance and other health problems. But why must brown fat activators be expensive and problematic synthetic drugs? There are a number of nutraceuticals (aka dietary supplements) that are documented to exert beneficial effects for the production and activation of brown fat. These include but are not limited to resveratrol, curcumin, EGCG green tea extract, garlic, melatonin, capsaicin from red pepper and Fucoxanthin, a seaweed extract. The brown fat paradigm to overcome obesity has yet to take off. Such a revolution, which was scientifically posited in the 1970s and 1980s got side-tracked when it was mistakenly concluded brown fat was unimportant in adult humans because they have low numbers of brown fat cells. Such a revolution appears to have stalled due to the lack of commercialization of the idea. Yet safe and economical nutraceuticals abound that markedly increase the numbers and activation of brown fat cells. While the brown fat revolution may have stalled, physicians would certainly be attracted to the idea of surgically implanting brown fat as has been done successfully on an experimental basis. A tragic failing of western medicine is what is healthy must be obscenely profitable to gain physician adoption. The public appears to be waiting for physicians to prescribe and physicians appear to be waiting for Big Pharma to introduce synthetic drugs to do what nutraceuticals have already been proven to do. It is not like brown fat is a totally unproven idea. Indeed, it is no wonder there is such a lean population in Japan. The traditional Japanese diet includes green tea, seaweed and fish oil that are strong promoters of brown fat. The same goes for the Mediterranean Diet centered on wine (resveratrol), garlic and fish. The definitive book on the topic of brown fat, The Brown Fat Revolution written by James R. Lyons MD, was published in 2009 and has not received rave reviews at Amazon.com. [Amazon.com] So adoption of dietary and supplemental measures to activate brown fat is slow to materialize. There are over ten-thousand published online reports about brown fat at the National Library of Medicine dating back to the 1940s. Differences between the physiological activity of brown and white fat were presented in 1947. [Science Jan 31, 1947] There is no shortage of science. America was once a lean population. That dates back to the 1970s. Then came high fructose corn syrup and other obesogens like bisphenol A. The masses, given choices between what tastes good and what is healthy, will likely continue to opt for the former rather than the latter. Individuals don’t need to wait for government to fortify foods with brown fat stimulators or physicians to prescribe heat-generating drugs or implant brown fat in operations that are paid by insurance. Jump in a cold shower in the morning to activate your brown fat cells. Sprinkle some red pepper and garlic powder on your breakfast eggs. Drink green tea. Take a resveratrol pill with your evening meal. Studies show you will get a better night’s sleep as well. [Neuroscience Letters March27, 2003] — ©2015 Bill Sardi, Knowledge of Health.